I first tasted Brooklyn Commune’s food at a benefit event. Surrounded by elegant, over-thought dishes, Brooklyn Commune stood apart with shots of tomato soup accompanied by bites of bacon grilled cheese sandwiches. The soup was essential to cut the chill of the cold rainy day and the crisp, buttery sandwich bite melted in my mouth. How had I never heard of this place? Where was it located? Park Slope or Cobble Hill—it had to be one of those. But no, it was a neighborhood foreign to me, Windsor Terrace, down by the southern tip of Prospect Park. I was absolutely determined to find a reason to explore my newly discovered neighborhood, and more importantly, see what else Brooklyn Commune had in store for me. If a sip of soup and bite of sandwich could pack so much flavor, just imagine what was bursting from the walls of a whole restaurant. The chance to visit came last month. After spending the afternoon foraging with Leda Meredith, we managed to build up quite an appetite. Our trip conveniently ended near the south end of the park, an easy 10 minute stroll to the restaurant. 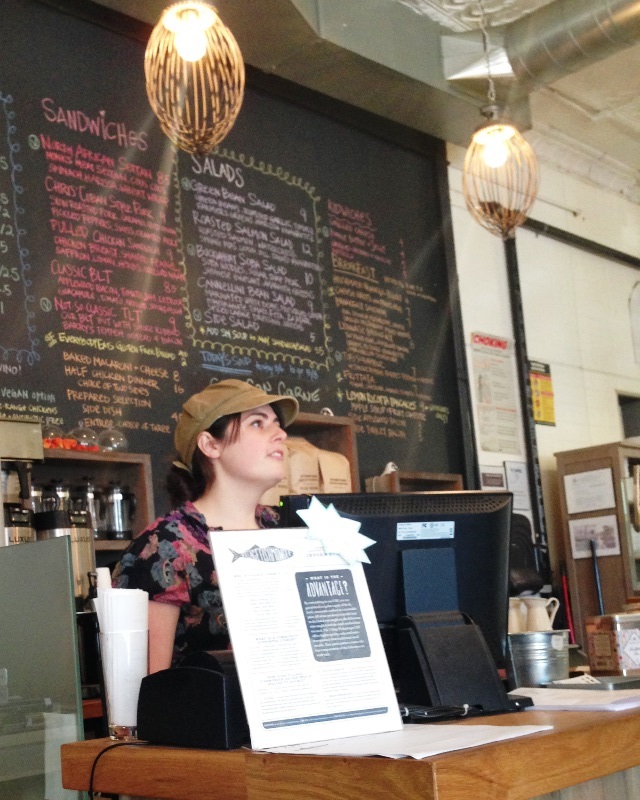 Brooklyn Commune is exactly what you’d expect from its name. The corner shop, right above the Fort Hamilton Parkway F and G station is warm and inviting, thanks to the huge windows that welcome sunny rays. Tables are communal. A few high bar stools line the walls with the rest a mix of small and large tables. Even at the somewhat off hour of 4pm, the place was bustling. Families, couples, individuals enslaved by their laptops, it was a space that welcomed a small party of friends or someone just looking for a cup of coffee and place to read. A heavy wooden service counter overflowed with baked goods and a large chalkboard wall stood behind it announcing the day’s menu. We hadn’t really had lunch and didn’t have big plans for dinner so we decided we could splurge a bit. We started off with homemade sodas. I swear, anytime there’s an option for an artisan soda, I’m in. I guess I’m making up for those 20 something years I wouldn’t touch the stuff. 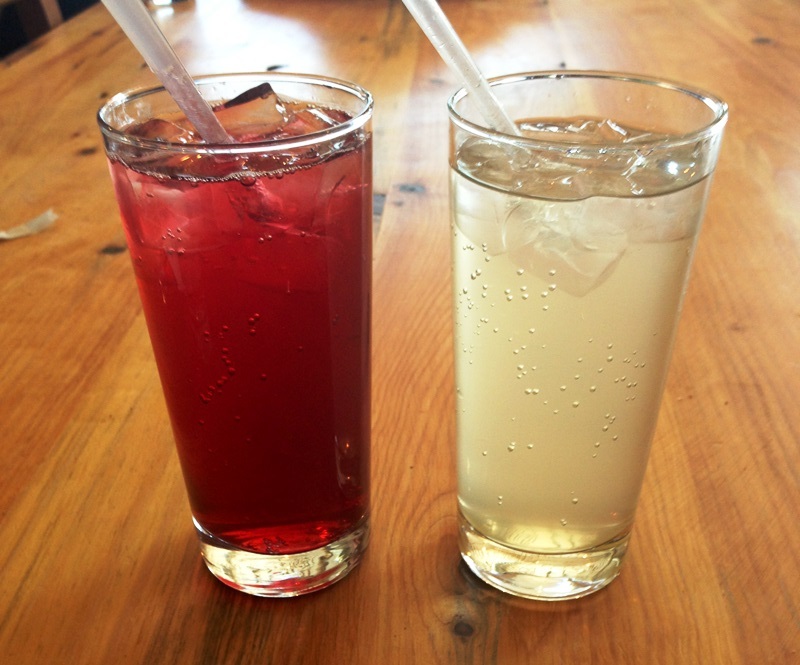 Hibiscus for me and grapefruit for my husband, made with soda syrups crafted by P&H Soda Co., right here in Brooklyn. Then onto the real food—two sandwiches plus a plate of mac and cheese to split. As much as I consider myself a locavore, I cannot turn down a dish with avocado. 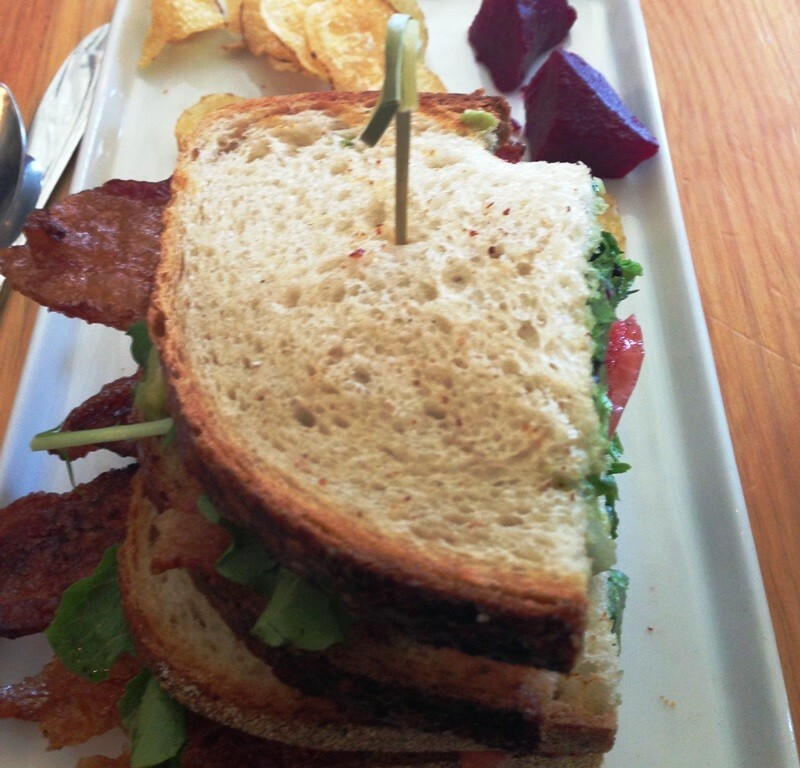 I opted for their “classic” BLT, complete with maple glazed bacon, lettuce and tomato plus some not so classic additions of guacamole and tomato jam, all on grilled sourdough. The sandwich was pure perfection. I’ve recently become a huge fan of tomato jam. I love tomatoes, so any way I can get some extra bump in the flavor is appreciated. The bacon was crisp, as was the lettuce, a great way to refuel after a few hours in the park. Slightly disappointed that he wouldn’t be having catfish today, my husband ordered a Cuban style pork sandwich. The sandwich was good, but I definitely won this round of ordering. The pork was a little dry—I have yet to find a Cuban sandwich I really adore. And the cilantro aioli? Well, cilantro is always something I’ll find fault in. I don’t understand what the big fuss is all about. 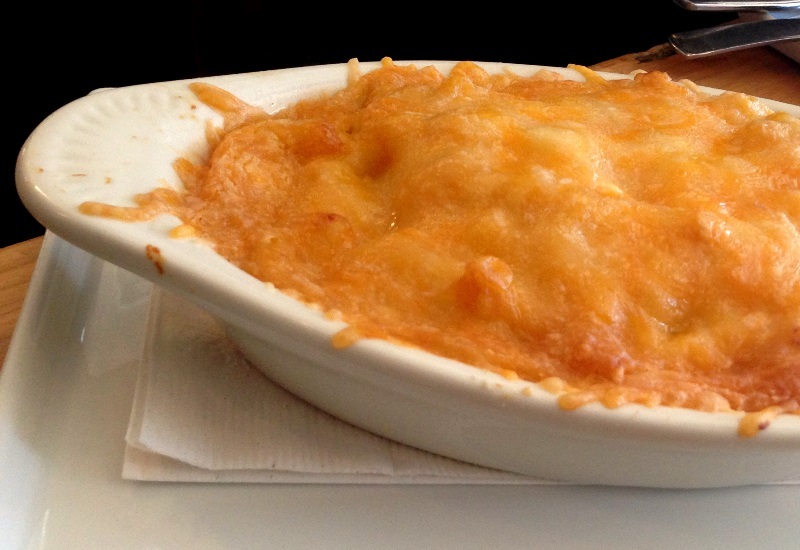 The Mac & Cheese was hot and crunchy. Cheesy, but not overly so. While I love a rich mac and cheese, this felt a bit lighter and a perfect accompaniment to our sandwiches and soda. We left with two cups of coffee to continue our walk through the park. This has been on my list to try, thanks for the review! The food sounds great. For me the only negative is its a bit out of the way, but well worth the trip. They do monthly supper clubs too and encourage BYOB (at the supper clubs). The May one was linked to sustainable seafood week. Wish I could have gone. They always happen on weekends I can’t make. That crusted mac n cheese looks DIVINE. Ah, you’re making me hungry at 7.30am! Not a good sign. Now, where can I find me some cheese….?! That’s what you get for reading the internet so early! You could make some cheesy eggs. Not mac and cheese but more acceptable breakfast and should hit the spot! Mmmm, cheesy eggs. Yum! And I do have a bad habit of reading delicious posts first thing in the morning before work. I need to stop. Wah!